A group of Mayo food service workers currently employed by Sodexo voted overwhelming Tuesday to join SEIU Healthcare Minnesota, the union representing hundreds of their colleagues. They expressed concern their voices aren’t being heard in Mayo’s decision to outsource operations to an Atlanta-based corporation. A total of 74 percent of the 108 eligible voters took part, with 89 percent approving union representation, SEIU announced. The vote was conducted over three shifts starting at 6 a.m. and running until 4:30 p.m.
"It is clear from the overwhelming 'yes' vote that we are ready to join SEIU Healthcare Minnesota and have a unified voice in the fight to make sure food service jobs stay good jobs," said Wes Keck, a Sodexo employee who has worked at Mayo doing food service for 17 years. "Many of us have dedicated 10, 15, 20 years to this job, and with all of the changes being proposed by Mayo, it will be good to know that we will now have a seat at the table moving forward. We are excited to be joining together with hundreds of other food service workers who have been standing up and fighting back for what is best for food service workers, our families, and our community." “We plan on continuing our work to hold Mayo to their promises that our jobs, which are critically important to patients, guests and community members, continue to be jobs that reflect the value and dedication we bring to our work," said Barb Andrew, a 15-year Sodexo employee at Mayo. Earlier this month, workers were in Washington, D.C., for a hearing before the National Labor Relations Board on charges that Mayo has failed to bargain in good faith with maintenance workers at its clinic in Albert Lea. 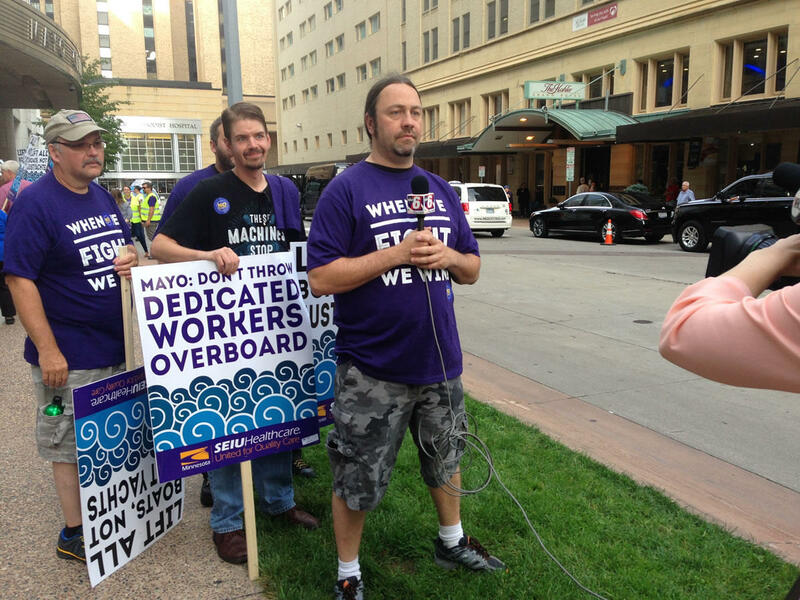 Jamie Gulley, president of SEIU Healthcare Minnesota, said Mayo’s actions reveal a pattern of disregard for food service and maintenance workers. “This is the first time a ULP brought by SEIU Healthcare MN has been in this situation [at the National Labor Relations Board], which shows how unreasonable Mayo are being in refusing even basic negotiations with a group of workers with decades of experience," Gulley said.